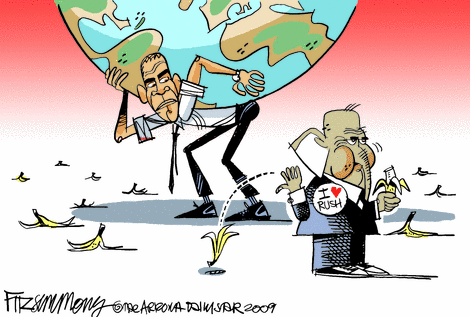 Last March, I noticed a cynical political cartoon depicting President Obama as Atlas. I would have rather seen the producers of the world carefully stepping through a field of booby traps set by Obama. Today, I noticed a new take on this upsidedown theme. This time, Patrick Corrigan shows Obama as pleading for help from the U.N. as the weight of the world bears down on him. Truthfully, the weight of the nihilistic policies of the people who imagined the U.N. are crushing the wealth-producers of the world. 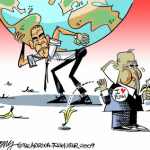 Portraying Obama as Atlas is doublethink. Because it’s the same image Rand used for her famous novel, the misuse of this metaphor is particularly galling.